This ornately painted bed is exemplary of Sütő’s inventive paint-making techniques. At his crafter’s booth, Sütő displays this traditional red cradle among other hand carved and painted pieces. Sütő carves large goulash spoons and tulip ornaments with a small knife tool. Informational banners and photographs hang at Sütő’s festival craft booth. This online exhibition is based on the documentation of traditional craftspeople at the 2013 Smithsonian Folklife Festival’s program, Hungarian Heritage: Roots to Revival. 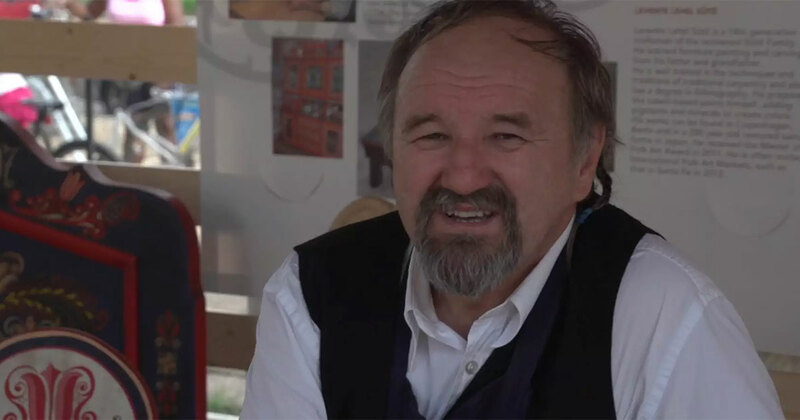 Levente Lehel Sütő was one of the twenty-four craftspeople who demonstrated his work at the festival. The Sütő family hails from Vargyas, a town in the historically Hungarian enclave of Szék in Transylvania, Romania. Furniture making and painting techniques like those of the Sütő family are specific to the Szék tradition—from the style and ornamentation of the painting to the furniture designs. “In some cases one can speak of a veritable dynasty of joiners. In 1568 for instance, the Sütő brothers, joiners and carpenters, settled in Vargyas, and from that date, 13 generations of Sütős handed on the tradition of floral painted furniture” (67).